Our dear friend and boarder Pamela L. Larson passed away suddenly on July 14, 2004. 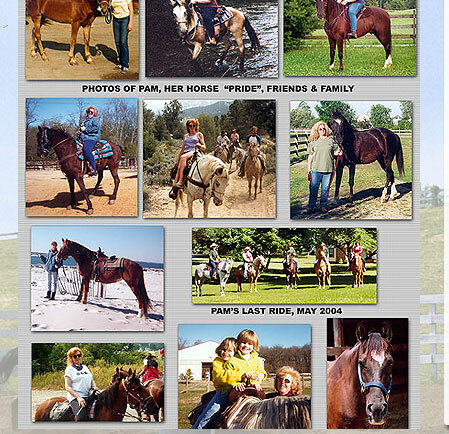 Pam boarded her horse Pride with us for the past few years. She loved coming to the farm and liked nothing better than to ride the trails on her beloved Pride. Her family has lovingly turned Pride over to our farm so that we may continue to love and care for him for the rest of his life, just as Pam would have done. We gladly accept Pride as part of our extended family. Pams ashes will soon be spread on the trails she loved to ride so dearly. We love you Pam and will miss you always. Any and all donations for Pride's care can be made to "Hopkins Horse Farm" and will be posted on this web site.